I’m not sure that we’ve all been there. But when I was a beginner in SEO, it seemed like I can do it alone for a long time. Until of course, I can’t. And then we are stuck in the dilemma if we should outsource or just create an in-house SEO team. 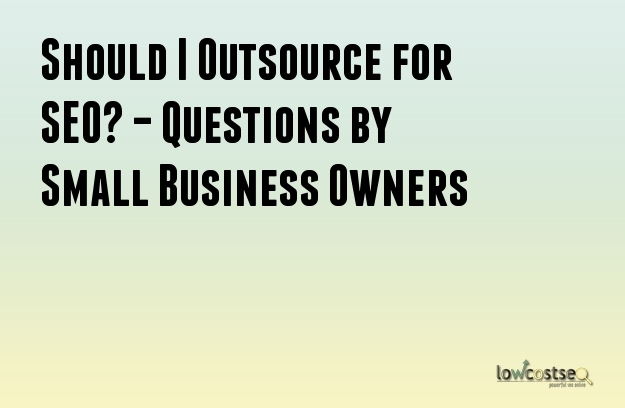 Or, what triggered you to think that outsourcing is essential in your business? With every goal, there must be a plan. That’s how we can determine if our resources will be enough or not. If your business is going smoothly, it’s likely that you already have some people helping you with online marketing even if it’s not really an official in-house team yet. But you have a helping hand. That’s good. Are you looking for a bigger result in the next six months? Is your team properly working? If you’re working alone, and you're aiming for something big, then it could be the right time to find people that want to succeed with you. How Much Are You Willing to Spend for SEO? Optimizing alone is still the cheapest approach. But if it’s too much to handle, then you need to start at a minimum of $250 a month and hope that you can find a reliable and cheap SEO firm immediately. Remember that SEO is not the only marketing technique available. If a different method works best and SEO currently works just fine, then maybe you can snooze the idea for a while. But if your business is solely depending on SEO, like it’s the only channel for you to earn, then you can consider mixing in-house and outsourcing. Is It Going to Help Your Business? Do You Have the Tools? At the end of the day, it should be about the future of the business. We’ve invested time, money and effort on it, we could at least let it run for a long time. Expanding SEO approach means there should be more tools too. Some of them need payment before we can use them online or offline. And even if we were able to afford these, being unable to use it properly is a waste of time. Do You Really Need to Outsource Right Now? The option is available anytime. While things are still moving slowly and it’s not harming your business, consider researching about SEO more. You’ll be amazed on how much you can do on your own. If outsourcing is critical for your business, be careful on which firms you are choosing. Some firms can promise to take you to the number one spot, yet those results don’t convert to sales. Then it’s not working (unless it’s your ultimate goal to just reach the first page of a SERP.) When you’re about to invest in a firm or a freelancer, be precise in determining what matters the most. Don’t be afraid of asking critical questions or reviews because that’s how you can guarantee the quality of the firm/freelancer.